Hello all, as of writing I’m still hard at work on the Gen 2 electronics. As part of this, I’ve recently struggled getting a new ESC protocol to work. The internet desperately needs all of the info about it in one place, so here we go! Most ESC’s support communicating over several protocols. Start talking in one of them and the ESC will automatically figure it out and start accepting commands. Standard PWM, also known as servo control. A 1ms pulse is low, 2ms pulse is high. As quadcopters keep getting better, they are demanding faster update rates out of their ESC’s. The ESC hardware and software has been desperately keeping pace. I mentioned in previous posts that the ESC’s we were using weren’t responsive enough for the meltybrain algorithm, and it limited our translation speed. It turns out that part of that is the protocol we used. We were using standard PWM protocol, which limited our update rate to only 500Hz. The analog nature of the protocol also caused us trouble, with the ESC’s being more susceptible to noise. We can now take advantage of faster protocols, with better noise tolerance. I’m going to focus on the one we ended up using. We picked DShot for two reasons: speed and noise. Being a digital protocol, you wont have small inaccuracies or noise issues. If you command 50% throttle, the ESC will see 50% throttle. And you can find ESC’s that support up to 1200Kb baud, which is pretty fast! A lot has been written about the basic details of DShot, like this excellent overview at blck.mn, so I wont get too in-depth here. I’ll instead focus on the practicalities of implementing a DShot controller. DShot is a digital protocol with several rate options, ranging from 150,000 bits per second to 1,200,000 bits per second. It’s a packet based protocol, where each packet consists of 16 bits. The first 11 bits are the command code, ranging from 0 to 2047. The 12th bit marks whether telemetry is requested, which would be transmitted over a separate wire (we don’t use this in Halo, sorry if you’re looking for details here!). The final four bits are a checksum, which is used by the ESC to validate the packet. The 16 bits are transmitted in 16 high pulses on the signal line, where the length of the pulse indicates whether it’s a one (75% duty cycle) or a zero (37% duty cycle). A quick forward, this information I determined through testing an ESC I bought off amazon. I don’t have an official standard, and can’t guarantee accuracy in all cases. But, it’s information I wish I had starting out, so I hope it helps. In standard mode, code 48 is the lowest throttle setting and code 2047 is the highest throttle setting, for a full range of 2000 throttle settings. Note that not all codes are shown in the list. It’s possible that different vendors use different code mappings, or it’s possible for extra features to be present. But it’s likely most vendors want to be natively supported by Betaflight, so that code list will be fine for the average user. To change the spin direction, set 3D mode, or save settings you must enable the telemetry bit in the associated command packet, and you must issue the command 10 times in a row for the command to take effect. If you issue command 0 and the ESC is not armed, it arms the ESCs with the throttle ranges set to <Either max range or the pre-programmed ranges, I haven’t worked out which>. If the ESC is armed it stops the motors. This command should be used if you want the motor to be stopped. If you try to use a throttle setting to stop the motor, it still spins slowly. If you stop sending commands, the ESC disarms. I haven’t timed the required update rate, but it’s pretty fast (10ms or less). This is a good thing, I was worried for a time that my bot would keep spinning if the code crashed! If you enable 3D mode, the throttle ranges split in two. 1048 does NOT stop the motor! Use command 0 for that. We needed to change the duty cycle 16 times over the period of the transmission. We could have programmed a loop that waits for the timer to send a pulse, and then load in the next duty cycle. But that would mean the code was stuck serving the transmission for the full duration, which would take too long. Instead we used something called DMA, or Direct Memory Access. This is a fairly advanced microcontroller technique, but when used correctly it can make your code extremely efficient. Our microcontroller (STM32F446) has a DMA peripheral that can be programmed to move a byte or a list of bytes from one location to another. Importantly, it can make this transfer at the behest of a different peripheral (such as our PWM timer), without involving the CPU at all. We set up the DMA to target the beginning of a list of 17 values and the duty cycle register in the timer. The 17th value of the list is just zero, which keeps the output low after the final byte is transferred. Every time the timer is about to reset and transfer the next pulse, it issues a command to the DMA to transfer a single value. This updates the duty cycle for the next pulse. The DMA peripheral knows to only send 17 values, after which it will disable itself. When we want to send another message, we just update the first 16 values with the new message, and re-enable the DMA peripheral. Below is my setup code for the timer and DMA. Again, this is for an STM32F446. I’m using ST’s HAL library for definitions. You also need to configure the appropriate GPIO pins for alternate function to make sure the capture-compare channels drive outputs. Now that we have the command in binary form, we just need to turn it into an array of duty cycles. The exact timing depends on the baud rate you’ve chosen, but DSHOT_1_TIME should be 75% of a full period and DSHOT_0_TIME should be 37% of a full period. And finally we point the DMA at the channel for the motor we want to command, and enable the peripheral. And that’s it! the DMA will happily chug along, push out our bits, and disable itself. It needs no further code interaction. Hello Everyone! Today’s installment of Spencer’s blog is being written by Halo’s second part, Pierce! I’m the brains behind the mechanical design and implementation of Halo, along with sanity checking all of Spencer’s work. I wanted to write this blog post to discuss the weakest point of the bot from the previous competition: The ring. The chassis of Halo is a unibody construction of 6061-T6 aluminum. We started with a 10” diameter by 1/2” wall aluminum tube that I turned down on my work’s manual lathe. I machined it into a C profile to help reduce the weight. The thickness of the wall is just over 1/8 of an inch thick. We discovered that we were overweight on the initial turning, so I reduced the weight of the ring by approximately 0.25 pounds by adding a 1/4” chamfer at the edges of the bot. This reduced the overall weight of the ring to just under 1 pound. The chamfer is not ideal because it pushes wedges underneath us, but the rapidly approaching impactor helps knock away our problems. Because of the thin nature of the ring, it introduces us to some structural problems. Our first design worked surprisingly well. The first tooth was just a small chunk of 1/2” A36 steel plate that had been trimmed down to save some weight. It was secured to the ring by two grade 5 1/4"-20 hex head bolts. I was immediately worried that the bolts may rip their way through the ring, or crack it in half. Needless to say, I was flabbergasted when the ring survived all the way through the competition. By the end of the competition though, it was cracking right at the base of the impactor. Now, why was this happening? It couldn’t be because we were slamming into things at 1100 RPM, that’s totally not what would happen…. Okay, I’m joking. The impact force that we are applying every time we smack into something transfers a very large load to the bot. How large of a load? Well, it really depends on multiple factors, mainly how much energy is transferred to the surface we are impacting and the time that the impact lasts for. I decided to do a simple A-B comparison of the strength of the old tooth to the new tooth, so I decided to call the impact load 100 times the weight of the robot, or 300 pounds. I figured that amount should show us some good results on the FEA simulation. You may have heard of the term FEA (or Finite Element Analysis) thrown around. It is a method of simulating the stresses on CAD parts. Most professional CAD packages have some method of doing FEA stress analysis built in. I simplified the model down to a small cross section of the ring with the original tooth. Simplification keeps the simulation run times short and reduces the likelihood that something weird happens. The ends of the ring become our “fixed points” for the FEA simulation, and the tooth is bonded to the ring in this simple simulation (I use a better contact set for the redesign, don’t worry). Once all of the materials are defined, and I ran the simulation, I got results that I expected. The ring showed stress concentrations right around the tooth, with the ring deforming into the S-shape which is slightly visible in the after competition image above. Okay, but what does this actually mean for our impacts? How close are we to actually causing damage to the ring? For that, I switched into the Factor of Safety (FOS) view. This shows how close each piece is to experiencing plastic deformation (the technical term for when something actually stays bent). The view is effectively dividing the shown stress by the yield strength. An FOS of 1 means that the material will survive if everything in the model is exactly correct with no simulation inaccuracies. Obviously, we don’t want that to happen, so we want a FOS that is higher than 1. An FOS which is lower than 1 is usually extremely bad because the part will deform under the load! What is a good FOS to target? That is really up to you. If you were selling parts for aircrafts or cranes or personal safety, the FOS’s are usually well defined by regulations. I like to keep parts on the higher end of FOS, usually 3 or higher, because they can stand up to greater hits. As combat robotics are one-off devices rather than mass-manufactured devices, having extra material costs / weight is not too big of an issue. FEA FOS Plot for the Original Tooth Showing the Front. Whoa! The minimum factor of safety on the tooth is 0.29? Could that actually be correct? In fact, it is. If you look very carefully at the root of the impactor in the after competition image , you can see where the curve of the tooth actually curves slightly away from the ring (it’s right at the top right corner of the tooth in the image). It’s pretty hard to see in that image, but is more visible in person. So, we actually caught some plastic deformation there, but what about in other spots? What caused the cracking? 0.93? That’s under an FOS of 1, and we can see in the post competition image that the ring does bend and crack right in that area. I’d call this simulation close enough to use for an A-B comparison between the newer versions and the original. Now that I know why the ring is cracking, I set out to stop that from happening. I knew immediately that there were a couple ways to increase the strength of the ring. Change Ring Material: Not Feasible. Nobody makes 10” titanium tubing, and I really don’t want to turn down that big of a billet of titanium. Change Ring Thickness: Probably Not Feasible. We were close to the weight limit, and changing the thickness of the ring really increases the weight. Change the Tooth: The best option. We can redesign the tooth to reduce the stress that gets transferred to the ring, indirectly increasing the strength of the ring. The ring was killed by the moment around the base of the tooth. That linear force of the impact was transferred as a bending moment to the ring. The short base of the tooth was causing a large moment on the ring. If I can increase the length of the base, I can reduce the moment on the ring, which should help prevent it from being damaged. I started by just directly adding length to the tooth base. This put me far overweight, so I started trimming weight by decking the active area of the tooth to a 1/4 inch and adding some speed holes. I thought this design looked rather odd, so I decided to think about where I could actually remove weight in this part. Luckily, there is software for that. I used another FEA tool called an optimizer to tell me exactly how much material I needed to have. You define the forces on your part and any fixed geometry that you want, and it tells you what you can cut off. Quantum from Team Robo Challenge is doing something similar. Or, at least, that is the theory. I use it mainly to tell me which areas I can remove weight from safely. I never take the optimizer fully seriously, as if your assumptions are incorrect, the parts will be too weak. It truly is a garbage in, garbage out system. By feeding in the basic model of the iteration one tooth into the optimizer, it resulted in Iteration 2. I screwed up when I started this tooth. I forgot the critical rule of write ups. If you are going to write something up about this process later, make sure you document as you go, not after. I forgot to to take an image of the optimized part, and I used the optimized model to make the model, which overwrote the optimized model. If I go back to take an image, I have to revert all of my work… Thus, all you get is a description of what it looked like when it was fully optimized. The optimizer spat out a model that looked close to this shape, but had rounded all of the edges to make them more like cylinders. The optimizer did this to reduce the weight, as those edges don’t add too much to the strength of the part, but do increase the weight. I kept them in the final model as I wanted to insure that the tooth would be strong enough. The actual reason why I removed them is that I can’t manufacture them. I don’t have access to a CNC mill, so keeping everything as nice straight lines makes it easier for me to make. This setup was nice, but it did have a smaller base. What happens if I flip the (not visible) mounting hole on the right side of the image to the other side of the tooth to increase the base further? Flipping the bolt hole was a good decision. Adding that flip increased the base by almost an inch, which increased the strength of the ring. This is the iteration that we will be fighting with, so I’ll go into more details with this one. Why does the arm that hangs off the back work? The best analogy that I can create is someone shoving you. If you are standing with your feet together, and someone gives you a good shove, you will probably fall over. The base provided by your feet together is too small. If you stand with your feet as far apart as they can go and you get a shove, one foot pushes harder down into the ground, while your other foot starts to lift. This is a similar concept to how the arm works. As the impact comes in from the right, the bending moment that gets applied is spread out over a larger area, reducing the overall force on the ring. I setup the FEA with this model, and ran it. Third Iteration FEA Showing a Gap between the tooth and the root. Remember how I said that I was planning on using a better contact set in the future? This is where it starts. If you look at the simulation results above, you can just barely make out a gap between the tooth and the ring. This is a good thing. Why? The connection between the ring and the tooth is a bolted connection, which behaves similarly to stapling two papers together. If I staple two pieces of paper together, I can still peel the pieces of paper apart, but they won’t slide past each other. The staple analogy behaves pretty close to a simple bolted connection. I used a “separation, no sliding” contact between the ring and the tooth to ensure that the faces could separate, but wouldn’t slide. I then “bonded” the bolt holes together to simulate the bolt holding those faces together. Using the bonding contact does introduce some problems in. The minimum factor of safety on this design is actually extremely small. It’s 0.29, and occurs right at the intersection of the bolt holes. This is a simulation artifact that I am choosing to ignore. Sharp corners near bonded faces usually end up getting large stresses shown, because the faces are perfectly bonded together in the simulation. This causes the math to freak out. As can be seen, the factor of safety on the ring right at the base is now 6, in comparison to the meager 0.93 that it was in the previous model. The force on the tooth is the same. The pure blue that is shown is the maximum factor of safety shown. In actuality, most of the FOS is over 40 because the stress on the ring is so low in most locations. With an FOS that high, the lower end in the 1 to 5 range becomes really compressed, so everything looks red. I shrunk the scale down to make it easier to see what was going on, as seeing a super high FOS is not that useful. With hollowing out the tooth, this tooth is 0.253 pounds, in comparison to the previous tooth’s 0.209 pounds. Not bad for only increasing the mass of the tooth by 0.05 pounds and getting a six-times strength increase. I can’t leave anything alone. I just have to improve on that tooth design. Overall, there are some weight savings that are occurring on Halo. We wanted to be able to target 3 pound and 1.5 kg competitions, but that leaves us with some mass available to play with. Well, what does that mean for this design? The answer: bigger and badder teeth. Meet iterations 3+ and 3++. Each tooth is respectively 0.253, 0.330, and 0.451 pounds. I’m hoping that I can use the largest tooth because that results in the largest bite and available kinetic energy. If either of the larger teeth are too heavy, we can also grind down the fang at the end to reduce the weight into spec. Other than that, they are all identical, so we can swap in any tooth to meet weight. Do these teeth work? I’ll leave that for you to decide. Here are the FEA results for the large tooth. Even with the largest tooth, we still get a factor of safety of safety of 3 with a 300 pound load at the end of the tooth. That should hopefully allow us to last a full competition without the ring cracking. The result: a pretty terrifying set of numbers. Meet Halo V2. Terrifying, even for us. I’m going to take this post as an opportunity to summarize the good parts and bad parts in greater detail. It’s clear that halo could transfer energy. We were spinning slower than planned, but the improve rotational inertia made up for the lost energy. And the low speed and large weapon gave us enormous bite potential. Even if most of that punishment came from itself, it’s still clear that the monobody design made for a tough bot. I still need to see what a good horizontal spinner would do to us, but the vertical spinners weren’t able to do much to the chassis. There just weren’t any good surfaces to attack. The motors also proved tougher than I had originally thought. We didn’t have to replace a single one all competition, despite the direct-driven wheels. We could attack in every direction at the same time. This was especially perilous for other spinners, which may not be designed to withstand powerful hits. Against wedge bots, we packed so much energy that even a successful deflection knocked our opponent away. This allowed us to spin back up in between contacts, preventing the wedge bot from pinning us. Battlebots is at least 50% showing off, and the LED display made a great show. The pinball action also made for a kinetic, exciting match. The sensor-fusion system detailed in this blog is great at filtering out spurious reflections, but what we saw in the match were consistent reflections. The result was that the beacon locked on to a random direction. I eventually got used to it and was able to adjust my driving, but it’s clearly not what was intended. Amazingly, the aluminum ring yielded before anything else did. It’s a testament to Pierce’s design and machining ability that it warped in this way, and still laid down punishment. Still, we should shore up the chassis there to prevent this from happening again. I need to more careful with my component selection and mounting strategies. More epoxy is also good. The LEDs are partially obscured by the modules on the circuit board, and It’s not always easy to see inside the ring. It would be better to find a way to make them shine outwards. We feel really good about this design, and other people seem to enjoy it too. So we will continue competing with it. Of course, we still have a lot of work ahead of us. The ring is a total wash. even though it “survived”, the crack in the chassis would only continue to get worse. The circuit board took too much damage, and would need to be replaced even if we weren’t marking any changes. On top of this, we are looking at some big design changes. I’m not going to remove the infrared beacon entirely. it barely takes any board space or processing power, so we might as well keep it as a backup. I’m currently investigating other methods that can provide an absolute reference, which if feasible will be detailed here. There also may be a way to make the beacon better. If I offload some extra processing to the microcontroller, I can look for the strongest signal instead of just the first signal. This may be able to ignore reflections entirely. The teensy served us well, but for mechanical shock reasons we should keep the number of plug-in modules to a minimum. I’m currently looking at the STM32 line as a replacement. Regardless of the choice, we will also port the code from arduino to straight C.
The ESC’s we had were wonderful for what they were. They proved robust and powerful. However, if I tried to change the motor speed too much too fast, they would lose track of the motor and reset. This limited how fast I could translate. I think the best thing to do is add sensors to the motors. This will give me much better control over the motor, improve spin up times, and let me win pushing matches. The motors will stay the same, I can just add sensors to the outside of the case. But the ESC will have to support sensored operation. So goodbye ReadyToSky 40A. I’m investigating ways to make the LEDs shine outwards. I would also like to take advantage of a faster processor and go from five LEDs to seven. This will let me show more detailed images. 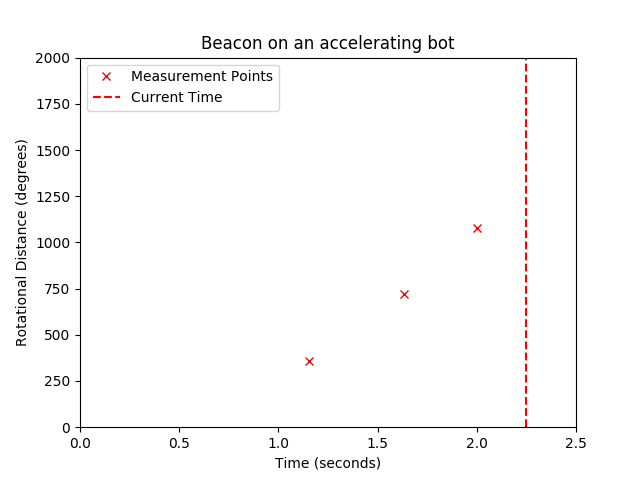 In this post, I'm going to talk about how I calibrated the accelerometer in my bot. The calibration finds the relationship between measured acceleration and robot speed. Measured acceleration comes into the processor in units of "LSB", or least significant bits. It's a jargon-y term that basically means raw data. We can convert LSB to g's by finding how many LSB are in the full-scale range of the accelerometer, then dividing by the full scale. But it's an unnecessary step since in the end we don't care about g's. We're going to directly relate LSB to robot speed. Where robotPeriod is our measurement, in microseconds per degree. The purpose of this calibration is to find the relationship between accelerometer LSBs and microseconds per degree. We will define the relationship between accelerometer data and microseconds per degree by taking twin measurements from a real-world test. I use the test stand from part 6 to hold the bot, and then I slowly spin up and down the bot. Meanwhile, the bot is measuring accelerometer data and beacon edge times. Beacon edge times tell us pretty directly our microseconds/degree, since they are measured in microseconds and we know our edges are 360 degrees apart. If you don't have a beacon on your bot, you can substitute with an optical tachometer. Our bot decomposes the data and sends it to the controller (this is why we used XBee's as our radios). On the controller side, we recompose the data, and send it to my computer over the usb cable. You can also do this by having a third XBee plugged into your computer via an XBee explorer, I just didn't happen to have one lying around. On the host computer, I have a python script running that pulls in the data. It doesn't do much but put it into a file for later. As you can see, there are some good curves, but lots of artifacts! We will filter those artifacts out here. In the final code, the accelerometer and the beacon will work together to filter those out in real time. Some easy artifacts to filter out include the ones at y=0 (when the accelerometer is reporting data but the beacon isn’t) and the ones at y= very large (which happens when the beacon misses several rotations. We add a simple high and low cutoff to filter those. Now we see the relationship we are looking for much more clearly. But, it’s in triplicate here. Every duplicate is due to the beacon missing N rotations. If the beacon missed every other edge, the us/deg would be double. If it missed twice in a row, triple, and so on. We need to remove the duplicate curves, as they aren’t useful to us. To do this, we will use a piecewise linear cutoff. That looks much better. We need to use curve fitting to find the closest equation to represent this curve. Luckily, python can do that too! Ouch, that is pretty ugly. Luckily it only needs to run every time we get a new accelerometer measurement. And if it ends up being too slow in the future, we can use a lookup table instead. If we multiply the speed of the bot by how long it has been spinning that fast, we get how far it has spun. This is accurate so long as we are measuring infinitely fast, or so long as the robot continues spinning at the same speed. The red shaded area above is comprised of three rectangles, one for each measurement. It's width is the distance in time, it's height is the measured speed. What our algorithm tries to do is calculate the size of the area under the velocity line. This area equates to the distance traveled. The simplest algorithm uses rectangles because they are easy to calculate area for (It's also known as the Riemann Sum). You simply multiply length (measured velocity) by width (time interval). But the graph above shows that when the velocity changes over time, some area is missed by the rectangles. All missed area represents error in the measurement, which causes drift. Given that you run this equation every time you get a new accelerometer measurement, the variables marked "i" are from the previous measurement and the variables marked "f" are from the recent measurement. 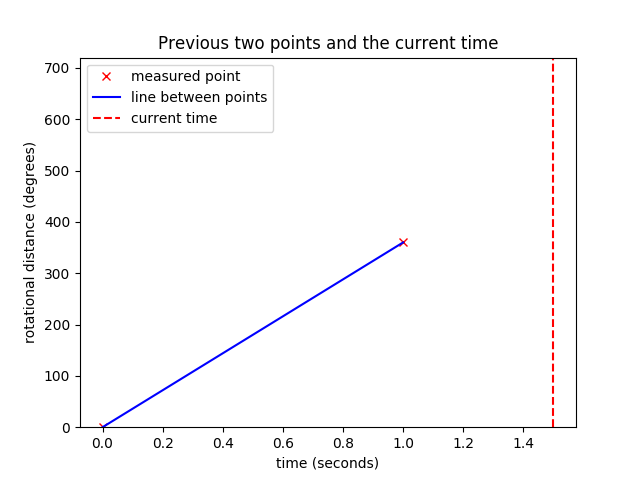 Where (ω_1, t_1) is the earliest measurement, (ω_2, t_2) is the most recent measurement, Θ_2 is the angle at the most recent measurement, t_f is the current time, and Θ_predicted is where we expect the bot is pointing now. In my implementation, I wasn't able to use the equations above as-is. This is due to the limitations of embedded arithmetic. Time in my bot is measured in microseconds, but distance is measured in degrees. so to bridge the gap, my velocity term needed to be in units of degrees per microsecond. In practice, that is a tiny number. A speed of one revolution per second is 0.00036 degrees per microsecond! Our microcontroller doesn't have a floating point unit, so any floating point operations are emulated in software. Consequently, floating point operations will be very slow. To remedy this, we can try to minimize our use of floating point in favor of integer math. Instead of running calculations using degrees per microsecond, we can use microseconds per degree. This turns our 0.00036 into 2777.78, which (rounded to 2777) is much faster to do math with. To support using inverse speed, however, we need to change our equations. To explain why this equation works better, lets say that the robot is moving at a constant 1000 rpm (around where we expect to operate) and the accelerometer is being sampled at 100Hz. 1000 rpm equates to 166.67 us per deg, which as an integer rounds down to 166. This is tau. t_f - t_i is the time between measurements in microseconds. At 100Hz, that time is 10ms, or 10,000us. 10000/166 = 60.2 degrees. I was able to do all of this math with integers only without losing too much precision. That would be impossible without redefining the equation in this way. This method can be used for final equations part A and B similarly. These equations should present much less drift than previously. Like for the beacon algorithm, we can trade complexity for precision. The main caveat here is that error is still generated whenever the acceleration changes. This should not cause as much of an effect as acceleration did on the rectangular method. But if you truly want the best-of-the-best here, you can substitute the trapezoidal method with Simpson's rule to account for when the acceleration varies over time. And you're only going to be as accurate as your calibration. See my next post for how I calibrated my bot. In my last post, I introduced two sets of algorithms. One to run a beacon-only system, the other an accelerometer system. The algorithms were fairly easy to work out the math for, and fairly easy to express in code. But say you need better. Say you need a perfect flicker display, or the easiest-to-control meltybrain bot possible. If you're that kind of builder (I am, at least), then you're in luck. We can take these algorithms a step further. The math is harder (read: longer), so I'm splitting this up into a post for both sensing systems. In the previous post, I showed graphs with beautiful, straight lines. The original algorithm works great if this is the case. But what if it's not the case? What if, for instance, the bot is accelerating? As you can see, the prediction diverges from reality. Our algorithm expects a line, but the robot is accelerating. We get a parabola instead. The error resets at every measurement, so this may not be an enough of an issue for the typical meltybrain. But if you made it past the first paragraph of this post it must be an issue for you. What if instead of keeping track of the last two edges, we keep track of the last three? The equation has three constants we need to solve for. Fortunately we have three prior points to help us do that: (x1, y1), (x2, y2), and (x3, y3), where x1 is earlier and x3 is later. We can simplify by understanding that y1=-720, y2=-360, and y3=0. These equations should work even if the bot is not accelerating. There will still be error in your calculation if your acceleration varies over time, but those events tend not to last very long. 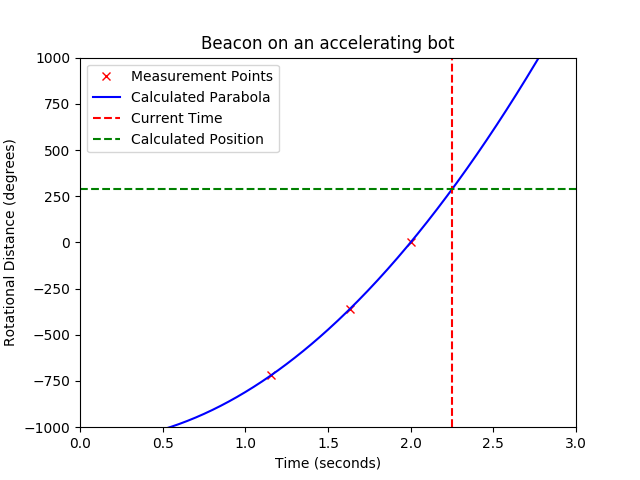 An additional gotcha you should know about with either beacon algorithms (linear or parabolic) is that missed beacon edges can severely disturb your predictions. The bot will think it's spinning much slower since the edges it saw were so far apart. This disturbance lasts longer in the parabolic algorithm since the "memory" of the event lasts an additional 360º. Clever code can handle missed triggers, but it will need to be specifically coded in. You can find the full code here. Read on for a discussion on how it works! I had originally planned testing controls code with the robot on it's own two wheels. But after a catastrophic failure in one of said wheels, it was determined I would need to wait for my partner to machine some new ones out of aluminum. That would take too long, so I picked up some clamps and printed a test stand. Test stand in place, I started working on the code in earnest. The overall code structure follows the block diagram above. I wont go into detail on how I implemented every feature. Hopefully comments in my code can handle that. Instead, I'll go through the architecture here. The main state machine is composed of three states: idle, tank, and spin. Idle is the "safe mode" the the robot reverts to if there is a problem or if the dead-man switch is released. In this mode the motors are set to 0 speed. I originally tristated the motor outputs using my voltage-level translator, but found it caused odd behavior in my ESCs so I now only manipulate the speed. When the robot is enabled, it transitions to either "spin" or "tank" depending on the throttle slider. If the throttle is very near 0 it goes to tank, otherwise it starts up in spin. The robot reverts back to idle if the communications time out or the dead-man switch is released. Tank mode allows the robot to be controlled like a ram bot. This is good for testing and as a backup in case for some reason spinning is ineffective. It's a bit of a misnomer, as I actually use arcade controls in this mode, but the name stuck. While in spin mode, the robot begins reading from the accelerometer and the beacon to determine the real-time heading. It also powers the motors as allowed by the throttle command, and taking account steering pulses. While the bot is in spin mode, it is constantly running math to figure out where it's pointing. I've been pretty nebulous about it thus far, but I'll do my best to explain it here. First I'll focus on using the infrared beacon. Looks like the robot is rotating at one revolution per second. Now, a little later, the robot tries to figure out where it's pointed. We only know the graph above, and the current time. To find which way we are pointing now, we just extend that blue line, and find where it crosses the red dotted line. Now for an equation form of this method (with thanks to wikipedia). X in our case represents time, and y represents distance in degrees. The earliest point measured is (x_k-1, y_k-1), the latest point measured is (x_k, y_k), and the current position is (x_star, y). We can simplify this a lot by realizing that our previous two points were 360º apart in y. For simplification, lets say point one is at (t1, -360º) and point two is at (t2, 0º). The current time is t3. Where newTime is the current time, beaconEdgeTime is the latest edge time, and beaconEdgeTime is the edge time before that. I replaced the last minus sign with a modulous to make sure the angle never goes above 360º. This system works great for if have just an infrared beacon. However, if your robot accelerates or decelerates during a revolution, the code above will not account for that and error will be introduced until the next beacon edge. Accelerometers measure the rotation speed of the bot by measuring centripetal acceleration (a_c). Where omega is rotational velocity and r is the distance from the center to the accelerometer. This is unlike the beacon, which measures the rotational position of the robot directly. The benefit, however, is we can make measurements constantly, not once per revolution as before. If the accelerometer is mounted against the ring wall as in our design, the z-axis (which looks radial to the ring) is your centripetal acceleration. In addition, the other axis have value for us. the axis axial to the ring (up and down when the ring is flat on the ground) measures only gravity, so it can tell us if the bot has been flipped over. The axis tangential to the ring tells us the acceleration of the ring, which an advanced programmer can use like a gyroscope to improve our algorithm. Where Θ is angular position. These equations let us make a perfect measurement of distance from speed. Unfortunately, they require us having knowledge of the speed at all times, and we only have periodic measurements available. But if we replace the 'd's with deltas, we can get close to the correct value. Θf is the current angle of the robot, omega is the last measured speed, tf is the current time, ti is the time of the last measurement, and Θi is the angle of the robot at the last measurement point. The final equation above is the most basic way to measure position using an accelerometer. The catch is that there was a certain amount of error introduced when we turned the d's into deltas. That error builds up and causes your angles to drift over time. If you are looking for the best of both worlds, accelerometers and beacons pair together easily. The best way to do this is to code the bot as if it was accelerometer only, but 0 the angle every time you see a beacon edge. This allows for real-time speed measurement without error build up problems. You can also use this system to prevent beacon miss-triggers from confusing your bot. This is possible by checking your accelerometer-measured heading every time a beacon edge is recorded. If the edge occurred way faster than the accelerometer was expecting, you can safely ignore it. Before I get into the details of the software, I want to make some points about how this code needs to run. This code needs to be, if nothing else, bulletproof. If it hangs, crashes, or otherwise behaves erratically, it could cause you to lose the match. More importantly, it could seriously harm yourself or others. Battlebots are not toys that can be used recklessly. Even beatleweights can break bones, and anything heavier can easily kill someone. Meltybrains put your code directly in charge of the drive motors. If you screw up, the bot could take off unexpectedly and hurt someone. As an example, an early version of our handheld controller had the dead-man switch wired in a normally-closed configuration, such that holding the switch opened the circuit. This was a huge mistake; if something else caused an open-circuit (say a broken solder joint), the robot would become enabled! Sure enough, the controller ended up developing an intermittent connection that caused the robot to suddenly enable and drive at random. Luckily spin mode wasn't coded in yet, so no damage was done. But it was a scary reminder of why you need to really think through the systems you're building. That header opens up a massive can of worms. This is a constant topic in all of computer science, and I can't possibly hope to do it justice here. What I can do is give some practical tips that I've utilized to make my own bot safer. I'm going to focus on arduino throughout this post. I used arduino, and I suspect that most people reading this with the intention to build their own Meltybrain will likely do the same. println() reads in bytes until it reads in a newline character, after which it returns the full array of bytes as a string. This is an extremely simple method, so most new coders start here. The big problem comes from what your code is doing while println() is waiting for the newline: nothing! Your code will happily sit there forever waiting for the newline to arrive. This method is a synchronous, or blocking method. Meltybrains need to crunch numbers much faster than your communicators and sensors can give them to you, so doing nothing while things finish wont get you far. You can get this method to work by using an RTOS, but that brings its own set of headaches, so I won't recommend it to a new builder. This method periodically checks to see if there are bytes available. If there are, the bytes are downloaded and stored for later. If a newline is received, all of the stored bytes are sent to a function for processing and the buffer is reset. This is called a polling loop, and is our first asynchronous method. It's also the method I use most in our bot. It allows you to do other things while waiting for a slower event to complete. Notice that the code looks pretty similar to way 2. The primary difference is that instead of placing it in loop(), we have placed the code in serialEvent(). serialEvent() is a special name that tells Arduino that this code is an interrupt service routine, or ISR. ISR's are sections of code that run when something happens. The function above runs any time our device receives bytes over the serial connection. Since the byte handler automatically runs, we don't need to constantly check if we've received any bytes as in the polling example. This can save us even more time to do more important things. Also, the processor drops everything it's doing to run the ISR. So we will receive bytes even if the code is currently blocked! The original code resumes after the ISR has completed. That last note is also the weakness of this strategy. If you receive too many interrupt events or your ISR takes too long to run, you can end up spending all of your time in your ISR instead of running other code. So you need to manage your interrupts carefully, and limit how much code you put in your ISR. Despite our best intentions, "stuff" happens. Our code can crash or end up in weird places, and we may be powerless to save it. There is something we can add such that if our code goes kaput, the robot still safely carries on: watchdog. Watchdog is a timer that constantly counts down. If it ever hits zero, your processor resets. Normally that's bad, but you can prevent it from resetting by "feeding" the watchdog. This resets the timer, but doesn't stop it. As long as you keep feeding the watchdog, your processor wont reset. But in the off chance that your code freezes, the watchdog will "get hungry" and restart your processor. You can also make it do things right before the processor restarts, such as turn off your motors. Useful! Instead of getting into it here, I'll point you at this excellent writeup of implementing watchdog in arduino. I highly, highly recommend you implement a watchdog in any battlebot that runs code. If your processor freezes without one, it's likely you wont be able to disable your bot. This is incredibly dangerous! No one is a good enough coder that watchdogs aren't useful. Despite the skill of my mechanical-mastermind-of-a-partner Pierce, there just isn't a whole lot of space for circuitry. We found that a custom PCB was the best solution. I wanted a radio that allowed a serial stream through, and I wasn't sure how powerful it needed to be. That makes the XBee series the perfect hardware for the job. 2.4GHz with enough channels to make event organizers happy, and modules of several different power levels for any arena size. Beware though, they are 3.3V logic only! Running at a screaming 72MHz, this ARM-based microcontroller has all of the power I need, and is arduino-compatible to boot! It also has better timer peripherals than the standard arduino board, which is great for applications like this. This board is 3.3V only, which is compatible with our XBee, but incompatible with many other devices, so beware. You may recall in my last post that accelerometers in a ring bot must measure extremely high accelerations. Our PCB will experience g-forces well over 300g's! This chip is the only easily-available one for the job. The device only comes in the painfully small LGA-12 package, so novices should stick to the sparkfun breakout board. 3.3V only. This handy little receiver comes in several different versions for different receiving frequencies. It outputs a low signal when it sees an IR pulse at the correct frequency. These are RGB LEDs that can be daisy-chained to allow for easy control. I can control the color and brightness of all five LEDs using only two microcontroller pins! Meltybrains only really need one single-color LED. But we're feeling ambitious, so we are going to use the five to display text and simple graphics using persistence of vision. They are 5V only, however, so I need to use a voltage-level translator (NLSV2T244) so that the Teensy can talk to them. I use this part at work a lot, so it made sense to use it here. It's cheap and robust, but only comes in a QFN package. There are a lot of regulators that can be used here, it's really down to personal preference. Again, just a simple buck converter that I use a lot at work. Careful, this is only rated to 0.5A, so more powerful radios may be too much. I don't mean to imply this schematic is the be-all-end-all here, there are a lot different approaches that can be used. For instance, instead of XBees you could use standard RC radios, which may be cheaper (though harder to feed into the arduino). Making sure everything can operate off of the same voltage level would simplify this schematic quite a bit as well. Nothing too crazy here, as all of the annoying layout work is done for us in the Teensy and XBee modules. If the surface-mount packages daunt you, the voltage regulators can be swapped for through-hole modules (See this 3.3V one or this 5V one). Though I hope you have more space than I did if choose to make the swap. I would upload these design files, but unfortunately they were made in Altium and are not easily read by the average hobbyist. Future projects will be done in KiCad. Sensors and radios are great and all, but we still need to move stuff. We are currently using two 750kV brushless outrunner motors as our drive motors. They are rated for 35A, and at maximum free speed they would rotate the ring at 11,100 RPM. Now, that free speed definitely won't happen (it doesn't factor in how much torque the motor needs to provide), but the specs are reasonable given our 2,500 RPM target speed. Motor selection is not easy for a direct-driven bot. We need the wheels to go fast since they are so far out-of-center. This implies brushless, especially since brushless power density is unmatched. However, in this weight class, it is very hard to find a sensored brushless motor. And sensorless motors have trouble at low RPM, leading to much higher spin-up times. But the biggest reason we picked brushless was mechanical. Brushless outrunner motors are really slim. And with some tricky design you can mold a wheel around the casing of your motor. This greatly alleviates the problems with moment arms pointed out in the previous post. We needed ESCs to match the power ratings of our motors, which lead to the Readytosky 40A. Running standard BLHeli firmware, they accept 5V PPM inputs. We ended up desoldering the barrel jacks to save space and weight, instead direct-soldering the motor leads to the ESCs. The PPM signals are easily generated by the Arduino Servo library, but we had to use another voltage level translator so that the Teensy could talk to the 5V ESCs. Add up all of the power draws, and it comes out at 80A max discharge rate. That kind of scary current can only be supplies by a lipo battery, and a big one at that. So our battery pack is a little oversized. We use two 2000mAHr 7.4V Li-Polymer batteries in series, giving a total pack voltage of 14.8V. The batteries are actually heavy enough that they provide the counterweight for our weapon tooth! Our robot is called Halo and it is a meltybrain. There are a few reasons we went with this design. The rotational inertia of a ring is double the rotational inertia of an equivalently heavy and large disk. And with the name of the game being more energy, the gain in rotation inertia can't hurt. Our chassis is a single piece of aluminum with some stuff bolted to it. While the ring is a bit tricky to machine (my partner will get into that in a later post), the overall assembly is very simple. This goes hand-in-hand with mechanical strength. The ring will be extremely tough to break, while keeping critical electronics efficiently protected. With the weight being concentrated on the ring edge, the radius of the robot can be a bit larger than is typical for the weight class. Given that rotational inertia has an r squared relationship, that gives us even more energy to work with. Due to the scarcity of mounting surfaces, the drive motors must be rear mounted. And given the lack of bearings, all lateral force on the wheels transfers directly to the rotor of the motor. Lateral force on rotors is generally a very bad thing and should be avoided. For us, we can only reduce it by shortening the moment arm. That means no gearbox; the wheels must be direct-driven and kept close to the ring edge. Even still, if the robot gets launched and falls directly on the wheels, the lateral force on the rotors will be huge. Direct driving wheels is hard, especially given the unusual amount of power our drive motors need to put out. Large motors with very low kV values are needed. And with the wheels very close to the ring edge, we are vulnerable to undercutting spinners. Most meltybrains use accelerometers as their main sensing element. Typically, the accelerometer is kept close to the center of rotation so that the g forces on it don't get too high. But for us, we can only mount our accelerometer very far away from the axis of rotation. At full speed, we expect our accelerometer to experience over 300g's! Over the next couple posts I'm going to dig into the details of Halo, starting with the electronics. Meltybrain is the name of a particular style of horizontal spinning battlebot where the entire robot spins on its drive wheels. If your looking to store more energy, the most obvious thing to increase is your rotation speed; it has a square relationship! Unfortunately, there is a limit to how fast you can go, and it's not just the max speed of your motor. Yep, point 4 is what really limits our rotation speed. Most spinners can run at 10,000 RPM, but in reality only run up to 5,000 RPM. While it's true that r has a square, in practice it all comes down to weight. The more mass you are willing to put in your spinner, the more inertia it holds. For most bots this becomes a tradeoff between spinner power and pretty much anything else. If your spinner is your entire robot, there is no longer any tradeoff between spinner weight and things like armor, drive motors, batteries, etc. Any mass that protects your robot or makes it go faster also contributes to a more powerful spinner. This is why saying meltybrains are the most powerful spinners (in theory) is objectively true. They can hold the most energy without sacrificing bite. Great, but how does it move forward? This is the tricky bit. You still need to move laterally about the field, while it spins. To accomplish this, the simplest way is to pulse the power of your drive motors at just the right place every rotation. The aggregate is that the robot drifts in whatever direction you're pulsing. You only need one wheel to do this! In order to pulse the motors at the right time, the robot needs to constantly know what direction it's facing. Robots can't know this without some kind of sensing element and a processor to crunch the numbers. Knowing the rotational speed, your robot can figure out it's direction by assuming "since I have been moving this fast for this long, i must have moved this far and am now pointed this direction." The catch is, every measurement has a small error. These errors build over time and cause the forward heading to drift. This can be corrected for by the driver, but the more drift, the harder it is. A gyroscope placed in the center of the robot can measure the speed of the robot indirectly by measuring changes in the speed. The processor can add up these changes to get speed. Because the gyroscope has an extra layer of indirection from the accelerometer, it generates more error. It can be used in conjunction with an accelerometer, however, to reduce the error caused by rotational acceleration. The encoder can be used to measure how much your wheel has rotated. This can be used to directly measure how far your robot has rotated. The main issue is any time your wheel slips, you generate error. Wheel slip happens any time blows are traded, or passively if the wheels are having trouble gripping the floor. If you put a light source on your controller (either LEDs or a laser pointer), and you point your light source at the robot, the robot can recieve the light source. Since the light is directional, the bot will only see the light when it is facing a particular direction. This can indicate to your bot where the forward direction is. This is an absolute reference, meaning it does not drift! the only catch is, light bounces. So get in the way of the wrong shiny surface and your sensor can still get false triggered. If you're going to do this, i recommend using a modulated IR source and reciever. IR so that your rival driver doesn't get distracted (something safety staff look down upon), and modulated so that bright lights and flamethrowers don't false trigger your sensor. If the robot is spinning at 5,000 RPM, it doesn't leave your processor much time to think. How fast your processor needs to be depends on what it's doing. The most minimal design can probably make do with 8MHz, but if you want to use advanced sensing solutions or flicker displays, think about getting a faster one. It's great if your robot knows which way is forward, but your driver needs to know too! The easiest way is to have an LED visible on your bot that blinks whenever your robot faces forward. Persistence of vision will cause you to see a streak on the forward side. I'll post my own code in a later post. For right now, OpenMelt is a great reference. A friend of mine and I have been developing a battlebot over the past several months. I thought it was about time I started documenting the project. This is the first attempt for both of us, so we aren't attempting to play with the 220lb monsters you see on TV. Luckily, there are non-televised events with weight classes all the way down to 150g. We settled on the 3lb beetleweight class as a compromise between cost and "kickass". The scariest of the lot. These bots store as much energy as possible in a spinning element, and then try to release it as fast as possible in their opponent. These are most often beat by wedges capable of withstanding the blows. There are a few exceptions to these trends (see: blacksmith), but the best advice for newbies like us is to pick and archetype and try to design around its weaknesses. When narrowing down our bot designs, Pierce and I were weighing "awesome factor" pretty heavily. Spinners are harder to build of course; poorly designed ones tend to destroy themselves more than their opponent. But They are also perfectly capable of launching both bots across the arena after a good hit (especially in the beetleweight class). Can either be drum style (see minotaur) or disk style (see counter revolution). They generally try to knock their opponent into the air with an uppercut. Since in this style the spinner is parallel to the floor, builders have more room to be creative. Most common is the spinning bar style, as popularized by the legendary Tombstone. After that, shells are fairly common, and then the occasional ring spinner. We chose meltybrain. Meltybrain is a style where the robot uses its drive wheels to spin in place. The result is that the entire robot frame becomes a horizontal spinner disc. This simplifies all aspects of the mechanical design, but with a catch: the robot still needs to be able to move laterally. But if it's spinning in place, how does it go forward? what even is forward anymore? The solution is to use a fast microcontroller, robust sensing, precise timing, and some math. This is quite a change from the dumb RC receivers most bots use, which is why most builders don't attempt this style. But if mastered, meltybrain can unlock massive damage potential while being tougher for it.